Your search for excellence has ended! We offer ultra luxurious vehicles that are not only comfortable & stylish... You'll find that they're affordable and within reach of most any budget! Tap or click on any image below to find out more about our fleet, and the spectacular amenities you'll enjoy on your trip with us! 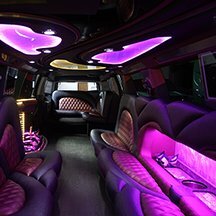 Each of our vehicles features a fully custom interior with leather seating, hardwood floors, amazing stereo systems, colorful lighting, and on board coolers. We have a great team who regularly inspects and cleans our vehicles so you can rest assured that the vehicle you rent from Flint Limos is safe, clean, and packed full of amazing features! Our vehicles are luxurious, to say the least. Flint's first choice in luxury transportation! Flint Party Bus is well known for our high quality vehicles, our professional chauffeurs, and our incredible amenities that customers go wild for when they travel with us! 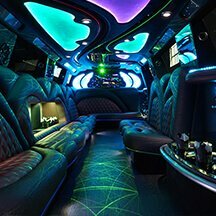 Below we'll tell you about just a few of the things that Flint Limousine is famous for. Our services features smaller party buses for 16 to 24 passengers, mid-sized party buses for 25 to 30 guests, or truly massive party buses that can seat up to 40 people! We also have a stunning Hummer H2 Limo for up to 18 guests that really makes an impression! 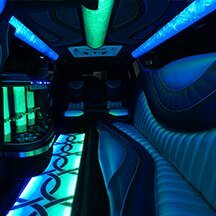 All of our party buses and limos are fully decked out with all the amenities that you expect, including built-in bars, flat screen televisions, audio systems, and LED lighting. You can enjoy your CDs or just hook up your MP3 player, and don't forget to bring DVDs! 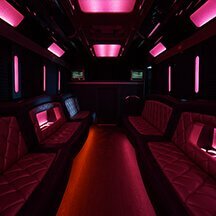 Not only that but the party buses provided by us are filled to the brim with even more features such as plasma TVs, granite topped bars with built in ice chests, stripper poles, and amazing high end audio sound systems with subs and that is just the beginning! Our professional chauffeurs are the best equipped to get you wherever you need to go in the Flint area, having undergone extensive training and having achieved complete familiarity with the area. They undergo drug tests, background tests, and driving record checks too. Where other companies will stick you with the highest bills possible in order to pad their own wallets, we will shuffle every bit of savings over to you, the customer. This is the quality we're known for. You'll never pay for more road time than you actually use. For exciting events such as weddings, bachelor parties, bachelorette parties, birthday parties, business events, sweet sixteen parties, high school proms, and even nights of bar hopping, call Party Bus Detroit! Our services are versatile and our bus array is sensational. With regards to other companies in Flint, nobody else offers the same quality amenities and expert level service that our company does. We offer more features and better customer service than every single other company in not only Flint, but the entire state of Michigan. We think of our customers as family and do everything that we can to make sure that everybody has an unforgettable time when they do business with us. Each of our Party Buses give customers exciting amenities, top of the line equipment, and we hire the absolute best chauffeurs in the business to take care of our customers' needs. If all of this sounds fun and exciting then please call us today! If you are traveling in other areas of Michigan, we would also recommend our partner companies. We operate our phones 24 hours per day, so you can contact us any time to get a quote! Planning a night out in Flint? Let us take you. With our service you'll travel in luxury and style as you hit up all the area's hot spots. There's no better designated driver than a top quality chauffeur. The ultimate girls' night out: Your bachelorette party! 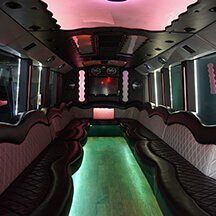 Whether you want to ride in a stretch limousine or pink party bus, we have the vehicle for you! Enjoy your night to the fullest on a luxurious vehicle. Whether you're celebrating 12 or 21, you can't go wrong with a fun party bus from us. Enjoy movies, music, and drinks (whether it's juice boxes or beer!). We service birthday parties for all ages! You deserve the finest on your wedding day. And that's where we come in. We have the most luxurious vehicles in Flint and the most reliable service. It's no wonder brides and grooms have trusted Flint Limo for their wedding day transportation for years. 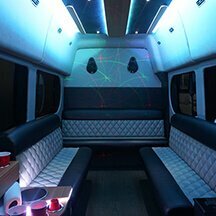 Party Bus Flint is Flint's premier luxury transportation company, offering a wide variety of luxury vehicles, 24/7 service, and state-wide coverage for any event.